Foolish love appears to be the Roux family birthright, an ominous forecast for its most recent progeny, Ava Lavender. Ava - in all other ways a normal girl - is born with the wings of a bird. In a quest to understand her peculiar disposition and a growing desire to fit in with her peers, sixteen-year-old Ava ventures into the wider world, ill-prepared for what she might discover and naive to the twisted motives of others. Others like the pips Nathaniel Sorrows, who mistakes Ava for an angel and whose obsession with her grows until the night of the Summer Solstice celebration. That night, the skies open up, rain and feathers fill the air, and Ava's quest and her family's saga build to a devastating crescendo. First-time author Leslye Walton has constructed a layered and unforgettable mythology of what it means to be born with hearts that are tragically, exquisitely human. I haven't had a lot of experience with magical realism aside from my love for Sarah Addison Allen and the movie Amélie. I've fallen head over heels for that movie and those books, but that's about the extent of my background with this concept. However, I was intrigued when I read the summary for The Strange and Beautiful Sorrows of Ava Lavender because it seemed reminiscent of those two things. I'm not sure if my expectations influenced how I felt for this book, but I suspect that they did. I went into this book looking for whimsical magical elements and lyrical prose. The writing was definitely gorgeous at times, but the magical parts of this story were very different from what I was anticipating. The magical infusions weren't whimsical or delightful. Instead, they often felt dark and ominous. Here's the main problem I have with this book - the writing is absolutely gorgeous, but it also seems to go nowhere. There were so many lines and phrases I wanted to turn over in my mind, and I found myself highlighting or noting little things I really enjoyed. It's the same way I feel watching to Amélie or reading Addison Allen's books. There's a poetry to the story that comes from the magic that infuses it, and I really love that aspect. 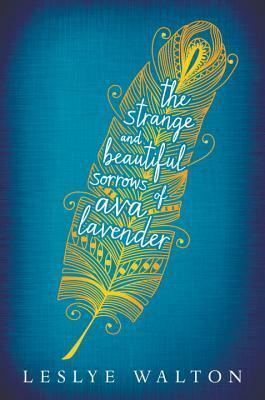 But I also really struggled with The Strange and Beautiful Sorrows of Ava Lavender because much of it felt really pointless. The first half of the book, at least, aren't even about Ava Lavender. It's actually her family history, which is somewhat interesting but didn't flow very well. I felt like some minor characters or back stories were too fleshed out and had no real relevance on the heroine or her story. It seemed like it was meandering aimlessly at times... no real forward momentum propelling me forward in the story. It read very much like an adult novel, and I can actually say I was really shocked by the violence in this book. There is a brutal, devastating scene towards the end of the novel that felt very unresolved for the amount of havoc it wreaked on the characters' lives. It's such a tragic, sad story, which I guess I should have known from the "sorrows" in the title. But I honestly thought it would be more hopeful and not quite so devastating! The other thing that bothered me is that I really didn't feel the story was realistic at all. It's also a "historical" novel if take the time period into account. I understand that magical elements will never be realistic, but (in my experience) magical realism tends to have very realistic story lines with added layers of magic that makes you ponder the little things in life that could be more than meets the eye. With Addison Allen, for example, it's wallpaper that changes to reflect someone's mood or food that can affect anyone who eats it. It's small, simple things that add texture and color to an otherwise realistic world. In The Strange and Beautiful Sorrows of Ava Lavender, I felt the magic overwhelmed the story to the point that it read more like fantasy than anything else. That's just me, and it could be because I don't have a lot of experience with this genre. As much as I wanted to like The Strange and Beautiful Sorrows of Ava Lavender, I couldn't get past how bizarre the story and characters were for most of the book. I felt the story lacked direction, and I was never entirely sure where it was headed or, more importantly, why it was headed that way. I think it's likely to appeal to a very small group of readers who will absolutely love it, but I sadly wasn't one of them. I enjoyed Walton's poetic writing, but I struggled with the rest of it. "She would feel her heart unclench and stretch its tightly coiled legs, preparing to leap into the path of yet another love. She'd think, This time could be different. This time it could last. Maybe it would be a longer, deeper love: a real and solid entity that lived in the house, used the bathroom, ate their food, mussed up the linens in sleep. A love that pulled her close when she cried, that slept with its chest pressed against her back." *I received a copy of this book from Candlewick Press in exchange for an honest review. I was not compensated in any way for my review. If nothing else, the cover is to DIE FOR! Oh I agree! The cover is gorgeous. This sounds interesting, but I hate when a story lacks direction. I do love fantasy stuff so the part where you said it felt more like a fantasy has my interest piqued. I might check this one out. I'll be curious about what you think of it! And I think it just felt fantsay-ish because there was such heavy magical elements that it hardly seemed historical fiction (even though it's set in the past). Although I'm sorry you didn't like this one more, I thought it was very interesting to read your thoughts on this one. I haven't read any Sarah Addison Allen (though she's on my tbr list) or seen the film Amalie, so I'm not sure how my experiences with the magical realism genre compare to yours (I've read books by many of the big magical realism authors like Garcia Marquez and Allende). I do agree this is a rather dark book, and I can see how that could turn you off if you weren't expecting it. Honestly, I didn't think about the mood before diving into this one and so I was all right with the darker turns it made. I think perhaps our experiences with magical realism did affect our enjoyment of this story. The ones written by Latin American authors that I've read were definitely more focused on families as a whole and various generations rather than on one specific character, and the magic of this story felt on par with what I've read. I can totally see what you mean though. I had trouble deciding whether to really define this as a work of historical fiction or not! It worked for me on basically all levels, but you may be right that this will be loved by a select group of readers, but not necessarily something that will be universally loved. This is really interesting! I have not had any experience with Garcia Marquez or Allende, and it sounds like (from your comment and April's) the generational saga with darker themes is more representative of those authors. So interesting how you can have totally different experiences and expectations for the same genre! My history with it was definitely on the lighter side - both with magical elements and with the the mood of the story - so I think you're right about our experiences with magical realism affecting our enjoying. I expected something completely different - and that's why this felt "off" to me. I loved certain aspects of the writing though and would be curious about what else Walton writes in the future! I'm very intrigued! I have this one for review as well, snapping it up on NG because of the way the title sounded pretty in my mind (and yes, that actually happens in my life). I'll definitely consider myself warned about this being a little darker than I would have expected, but I'm also admittedly curious about the story. Hah! Yes, the cover and title are just so lovely. I'll be interested in your thoughts on this one, Alexa! Well this is disappointing. I'm still new to magical realism (I only have one or two novels under my belt so far), but I was looking forward to this one. I also fell hard for the cover AND I have a niece named Ava. It all seemed like it was setting up to be a perfect Leah book. It's such a shame you weren't as into it as you had hoped! I've said it before & I'll say it again: we've got an eerily similar taste in books. I'm thinking that if this one didn't grab you, chances are I'm better off reading something else instead. Yes, I'm definitely very new to magical realism too! I haven't read anything by Garcia Marquez or Allende, which Amanda and April have both pointed out is more consistent with the generational saga and darker themes of this novel. I definitely think my expectations impacted how I read this one! If you were curious about it, I might say try getting it from the library. I loved the writing itself - it was very lyrical and quotable. So it could totally work better for you! In reading your post and the comments, I am kind of going to nod my head yes at what Amanda said. For me, I came in with Latin American Magical Realism experience and so, I expected the generational sorrows and the darkness, which kind of is a theme with Marquez and Allende. So yeah, I guess for me that was my expectation and lead into me being that small group of readers who LOVED THIS BOOK ahhhh. Also, this makes me want to read more Sarah Addison Allen. Okay, so I might say library this one. It's worth giving it a shot because the writing is really lovely. I just had way different expectations going into it. Though I'm guessing I liked the book more than you did, I do appreciate the honest review. I can see where you would say the story was meandering, but I guess I liked that it was meandering. Perhaps that is because I meander when I try to tell stories, so it makes it more like an actual account to me. Ha I personally liked the mystical elements in the book. I thought the grandmother's abilities to sense things based on a bird flying in the house and other insignificant details, or the mother's serious sense of smells and the warnings that brought her are concepts that were not overly mystical. They made me wonder about everyday, ordinary things. When it comes to certain stories being too fleshed out, I will say I don't get the point of the little girl, Fatima Inez, still hanging around. I thought the plot could have done without her. Overall, well thought out review, and I love the quote choice! There were definitely lots of beautiful lines throughout the novel. I will also say that I had a heads up on the darkness of this book, so though I agree it is much darker than expected for a YA book, I was not taken aback when I hit the darker parts. Otherwise I might have been shocked.